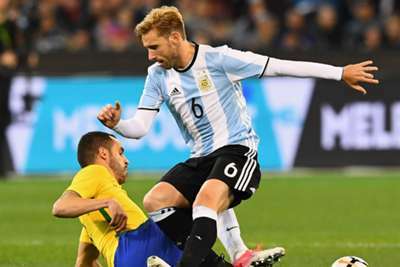 Argentina are awaiting further news on the status of midfielder Lucas Biglia after he fractured two vertebrae in club action for AC Milan. Biglia, who made 13 appearances in World Cup qualifying, was substituted after 72 minutes of Milan's shock Serie A defeat to Benevento on Saturday with a back complaint. And initial tests have shown the 32-year-old to have suffered a fracture of the transverse processes of the first two lumbar vertebrae, with additional examinations to follow. "AC Milan inform that Lucas Biglia reported a severe lumbar trauma due to an injury during Saturday's match against Benevento," a Milan statement read. "The player has undergone medical examinations that highlighted a fracture of the transverse processes of the first two lumbar vertebrae. "A detailed prognosis will be issued in the coming days upon completion of all medical tests." While Milan's Europa League qualification is far from secure, the news comes as a real blow to Jorge Sampaoli's Argentina, who struggled to perform consistently in qualifying. Biglia featured in all seven matches as Argentina reached the final four years ago.